"Pele, the Brazilian soccer player, was only 17 when his team won the World Cup in 1958, and many consider him to be the greatest soccer player of all time. 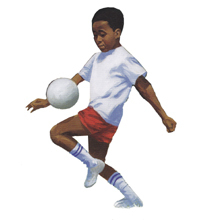 In this well-written picture book biography (Schwartz & Wade, 2007) by Lesa Cline-Ransome, students learn of the focus, tenacity, and perseverance Edson do Nascimento had from childhood that led to success in his chosen sport and a rise from a life of poverty. The author's compelling, well-paced text is accompanied by lush, vibrant paintings by James E. Ransome. Together they take listeners through Pele's boyhood soccer dreams and growth into a successful player. The author and illustrator have created a beautiful book. Narration by Brazilian-born Ibsen Santos further enhances the experience, providing not only correct pronunciations for the Portuguese names and words, but a trained voice that creates unique characters and performs the story with intensity and vigor. Background music and sound effects round out the production, making it truly exceptional. This audio production merits a place in every school library." "A torn net in the shade of a mango tree. A ball made of a sock stuffed with rags. Bare feet. Does this sound like an auspicious beginning for "soccer's first star"? In Brazil in the 1940s and 1950s, young Edson do Nascimento left school and, with his young buddies, the "shoeless ones," practiced moves, challenged older boys, and raised money for uniforms and shoes-all on his way to becoming a soccer standout. Ibsen Santos is an unobtrusive narrator who sets a leisurely pace and lets young listeners interact with both the text and the illustrations. Santos's delivery of the thoughts in Pelé's mind as he plays mirrors his athletic intensity. Radio broadcasts of soccer games add ambiance to the production, and an author's note provides additional information on the world soccer star."